The extended longitudinal flex groove in the sole makes the shoe too flexible underfoot for my preference. 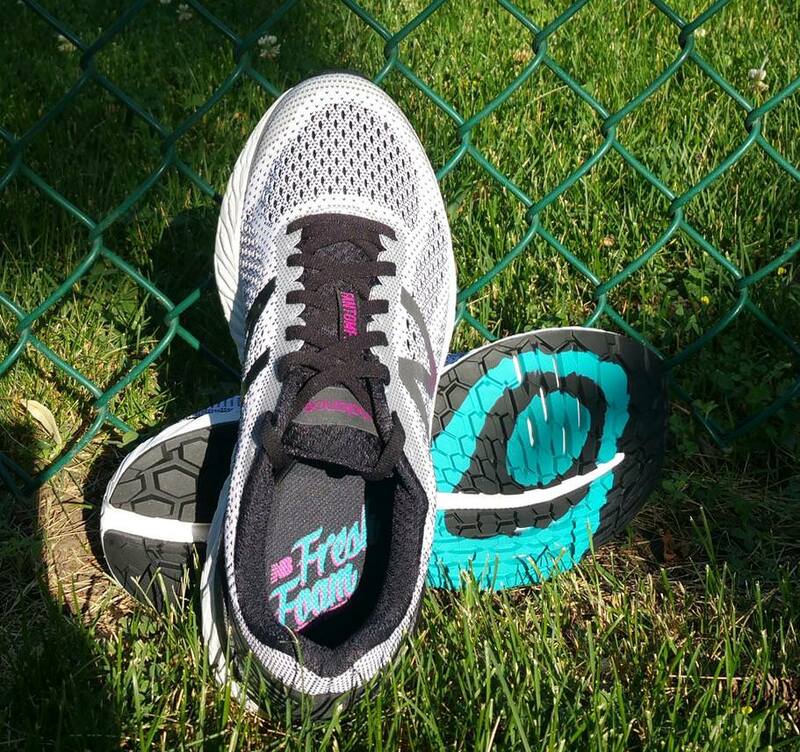 This is a great shoe for beginners and for those who run low-moderate milage and want to keep on with their day in the same shoes; that's the "comfort" factor that the new design features bring to the shoe. However, I hesitate to recommend this shoe to those looking for stability and motion control. You'll get a little bit of this from the Varus Wedge, but the shoe's flexibility offsets much of that benefit. On 7/17, Kristin decided to update her rating of this shoe from 2.5 to 3 stars. This is the rationale: "I recently wore the adidas Vengeful again and was struck by how much it reminded me of the Vongo v2. Given that the two shoes that I find the v2 to be closest to (Vengeful and Nike Odyssey 2, were given 3.5 stars and I originally ranked the shoe at 2.5 stars, I'm revising this ranking to three stars. It's still heavier (in my weighing, not the official weight) and more bulky than these previously mentioned shoes. 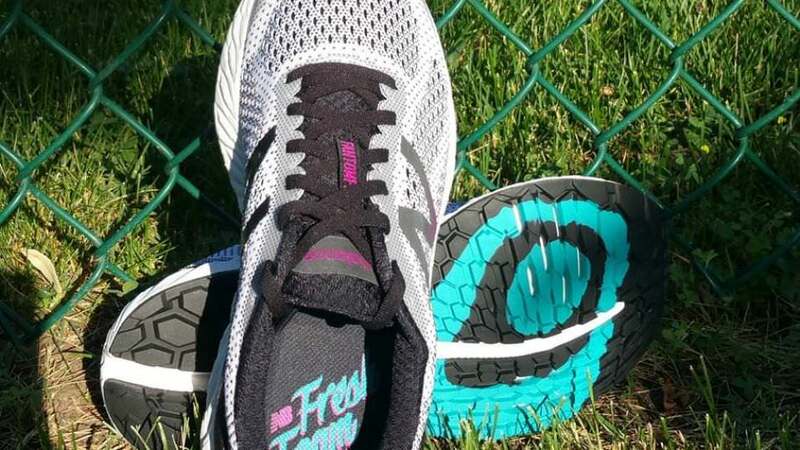 Although it did not stand out to me as particularly well-suited for a specific type of run (as did Odyssey), I do think that some may really like this shoe for its cushion and very lightly structured flexibility. " New Balance completely redesigned the upper for this second version, replacing structure lines and overlays with air mesh and internal plastic strips that run at angles below the mesh (the green) along both sides of the upper. A soft layer of fabric (bootie) lines the inside of the upper, altogether feeling very similar to to Nike’s Odyssey 2. It’s basically Odyssey with the opposite in offset (4mm. vs 12), slightly more room in the toe box and a bit more weight (.4 oz. heavier/shoe). It reminds me a lot of UA’s Europa in toe box fit and with the low structure of midsole (for a “stability” shoe), yet I do prefer Europa’s midfoot lockdown and heel counter. Vongo debuted last year as the first “stability” shoe in New Balance’s Fresh Foam line, joining their Vazee Prism and 1260 shoes in this category. 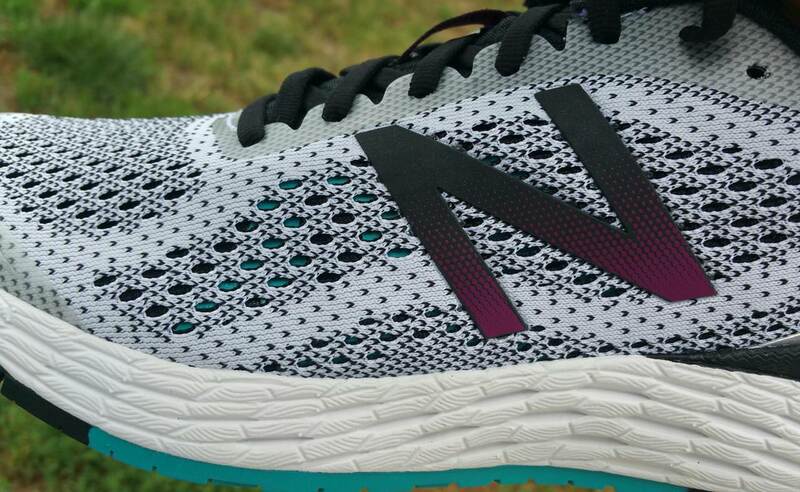 The New Balance Vongo v2 follows its lightly stable first edition with an even less stable second version as the structured upper was replaced with a mesh bootie design. An extended flex groove through the sole allows the shoe to move more with my foot, which together feel great for casual use. However I already have loose ligaments in my feet, so I prefer a higher level of support for running. I haven’t tried HOKA’s Hupana or New Balance’s Fresh Foam Cruz, two shoes designed as “casual running,” but Vongo v2 looks like the shoe that is more supportive than these yet not to the level of what I’d call a “stability shoe”…it’s the bridge between that new category of “causal-running” trainers and “technical” running shoes. I didn’t notice the “strengthening” benefit that I mentioned in my first Vongo review, but that’s likely because I’m used to running in them now. 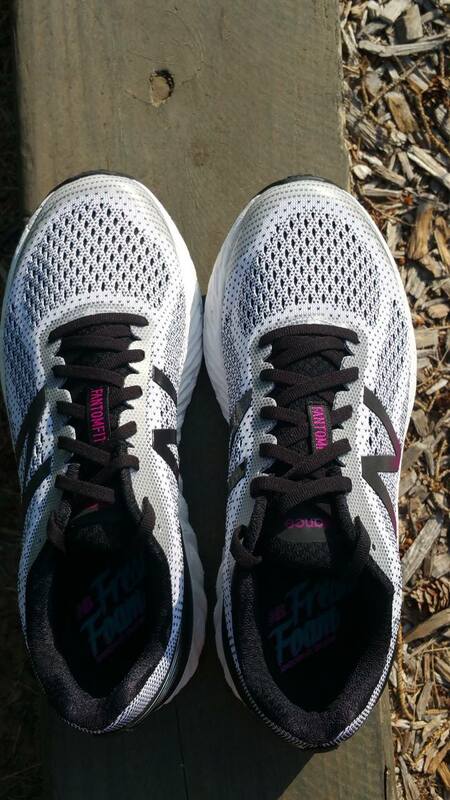 If you’re new to low drop shoes, I recommend easing into them by alternating runs with a shoe you’re familiar with. See the first Vongo review for more information about this. Out of the box the Vongo v2 felt surprisingly heavy given the upper’s new material. It weighs in at actually just over an ounce heavier than the first version (in my size) and is on par with the Transcend 4 and Supernova ST for weight. Despite the weight increase the shoe was very comfortable to walk around in, but it’s hint at lack of structure was confirmed as I started running in them. Vongo’s sole unit has some modifications but maintains the use of a Varus Wedge design and a medial forefoot that is flared out from the upper to ground contact, to combat excess pronation. Often found in heel wedges or shoe inserts, a Varus Wedge is angled from a higher medial side down to a thinner lateral thickness, to correct anatomical pronation of the ankle and its resulting ankle, knee and hip problems. Because Vongo relies solely on this built-in Wedge, without utilizing more traditional medial posts or midfoot shanks, the ride offered is more smooth than that of many stability shoes on the market. The brand’s Fresh Foam midsole is soft yet returns the energy applied into the toe-off (responsive). This second version has an extended longitudinal flex groove running almost the entire length of the sole, splitting a redesigned blown rubber outsole. The groove makes the shoe more flexible under the toebox, which takes away from the stability I appreciated in the first version. It also makes the shoe more easy to bend, toward the midfoot. The v2’s outsole pattern has deeper grooves, which promise longer-lasting tread durability than the shoe had previously, and the midsole’s appearance is changed, only affecting the shoe aesthetically. 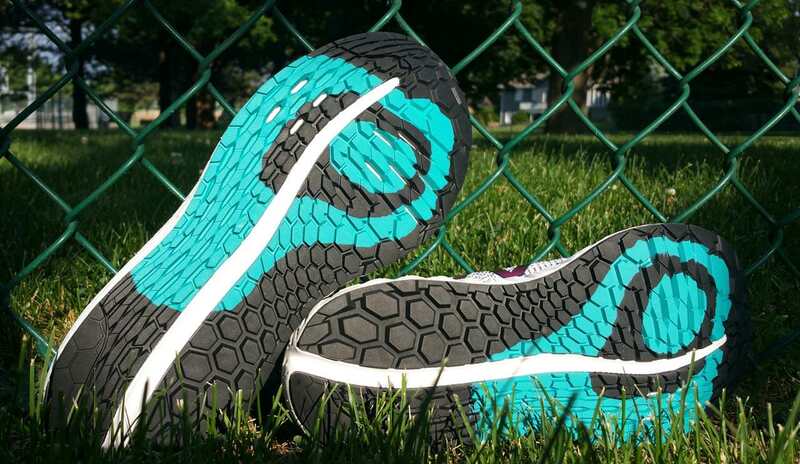 The Vongo’s new upper consists of breathable engineered mesh with a FantomFit overlay, which is strips of plastic running at angles through both sides of the upper, between the outer mesh and an inner layer of soft fabric. This increases the comfort of the shoe but decreases its structure. The sockliner is comfortable, and like the first version, I notice more arch support as the shoe is broken in; it must compress laterally after about 30 miles of pounding as the arch feels more comfortable for my medium-height arches, than it did when they were new. I prefer the v2 for casual use, but since this is a “running shoe” review, I do appreciate the more structured first version for running. The shoes pattern, however, is much more attractive. The first’s pattern was fun for being different…the second’s is more appealing in general. This shoe also comes in black with lime green and cobalt blue, white with blue, and red with lime, for the men and black with sea green, as well as vivid berry with tangerine, for the women. The heel fit is moderately snug (didn’t stand out either way), and the somewhat firm plastic around the back of the shoe helps to counter heel motion. The Fresh Foam Vongo v2 is a flexible stability shoe…the oxymoron of that phrase is why I ranked the shoe so much lower than its first edition. The extended flex groove in the sole increases the shoe’s flexibility in the forefoot and also brings a less-stiff midfoot: the shoe bends more readily throughout. The Varus Wedge midsole is the shoe’s saving grace toward stability. Vongo v2 may work well for some runners, especially those who run low mileage and/or those looking for shoe that moves with your foot but like the counter of the wedged sole. 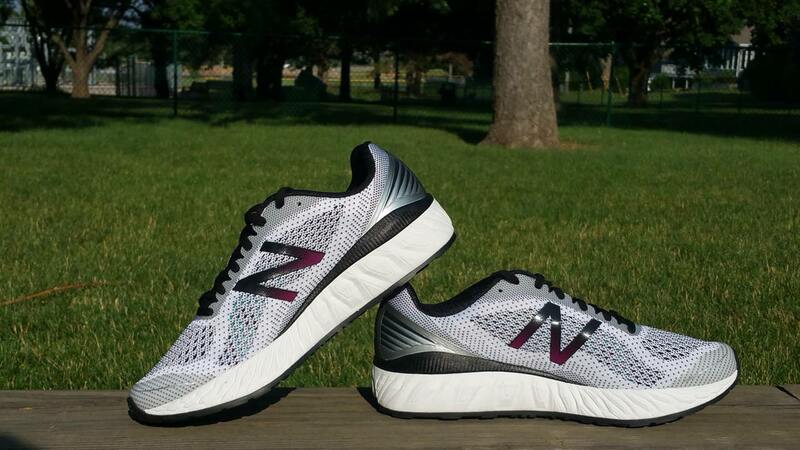 It’s comfortably breathable for hot summer runs. What do you think? Is this the shoe for you? Let us know in the comments! 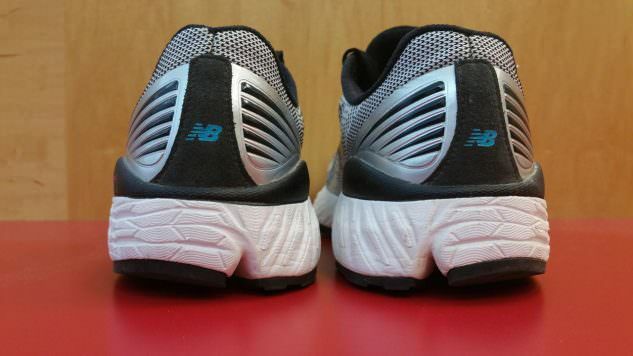 We thank the nice people at New Balance for sending us a pair of Fresh Foam Vongo v2 to test. This did not influence the outcome of the review, written after running more than 50 miles in them. Say whaaat??? “Varus wedge? ?” What is this- the Brooks Vantage Supreme? I am trying them on now and they feel like they COULD possibly work for me. I like the Kayano/ Saucony Guide 7/8/9 type light stability shoes. Just hadn’t heard “Varus Wedge” since the Brooks Villanove/Vantage/Vantage Supreme shoes of long ago. (Remember when Brooks sent out production with the Varus Wedge reversed? Oops!) Vongo seems to play into the more neutral-is-better trend. Seems promising. The old Villanova predated the ” VARUS WEDGE “. You know your shoe history! I didn’t know that Brooks sent out the opposite (valgus) wedge prototype!…funny. I haven’t tried the Saucony, but this shoe is more neutral than Kayano, for sure, particularly due to the less structured upper. I am planning to revise my rating of this shoe with an explanation as to why, just haven’t yet. I hope it works for you-let us know! Really like these a lot. I bought them to rotate with my Saucony Hurricane iso 4’s. Not quite as cushioned as the hurricanes but very comfortable and well cushioned. I have flat feet and overpronate mildly. Find that the shoe has enough stability for my stride. l also like the wide toebox and can feel the low (4mm) drop helping me land midfoot. Have about 40 miles on these Vongo v2’s and will try try the new v3’s which should have a touch more cushioning, a more structured upper and slightly more stability with higher sidewalls. I was looking for a wide (2E), neutral running shoe with reasonable cushioning and a low heal to toe offset. The only thing that nearly kept me from buying this shoe was the fact that it was being sold as a stability shoe. In lack of alternatives I gave it a try and ordered it directly from NB. Slipping into them for the first time I immediately was in love. They were just the perfect fit for my wider mid foot. More over it turned out that the lack of stability being criticized in the review are the game changer in my case. The support these shoes give me is just what I need. They allow for a smoth transition and feel so comfy that I didn’t want to step out of them after my first run. When it comes to style and production quality they make a great impression. Only the laces don’t seem to match the overall quality. Being elastic they allow for a good fit but I fear they will wear out or even tear pretty soon. All in all those are the best running shoes I ever owned in terms of fit and comfort. 5 Stars. the vongo v1 was the shoes i was looking for. the varus wedge associated with a strong upper in the inside gaves just enough of stability. the more flexible mesh in the v2 does not prevent my foot from rolling inward. I am just wondering who this shoe is for? hope the v3 will offer more stability! I agree totally, Trip. I hope NB goes back to the structure of the first version.